Perfect Cake Pops! 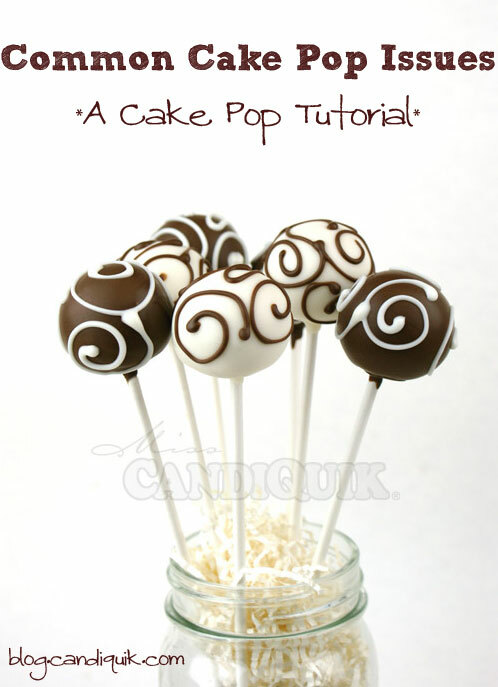 Be sure to check out my 'Common Cake Pop Issues & Tutorial' on blog.candiquik.com! Prepare and bake cake mix as directed on box. Allow to cool slightly, at least 30 minutes (longer if not in a hurry). Chill mixture approximately 2 hours in the refrigerator. Measure cake mixture and roll into 1” sized balls. Place on a wax paper lined baking sheet. You may need to place the cake balls back in the fridge for 20-30 minutes, allowing them to firm up. Insert a lollipop stick into each cake ball. You can dip the lollipop stick in a small amount of coating before inserting into the cake ball if you have had issues with it falling off the stick. *Tip: remove a few cake pops at a time to dip, storing the others in the fridge until ready. Melt CANDIQUIK according to directions on package, being careful not to overheat. If desired, add oil or powder based food coloring; stir until blended. To Dip: you can use the tray that the coating comes packaged in, or a deep microwaveable bowl or a mug/cup works great. Dip cake pops in melted CANDIQUIK; allow excess coating to drip off (hold at a ~30 degree angle allowing the coating to drip off the bottom and not drip on the stick) by tapping the stick and place in the Styrofoam block to set. For smooth cake balls, trim off the edges and bottom of the cake. Mix crumbled cake thoroughly with frosting. For best results, use your hands to thoroughly combine the cake and frosting together.